Rabbits are amazing creatures. If you have ever had the pleasure of having one run around in your home, then you know that they are playful and mischievous. How many times have you had to fish one out from under the sofa or stop one from chewing on any fabric in its way? Just like dogs and cats, rabbits are a part of your family, and you want to treat them as such. With a professional rabbit house, you can give your rabbit somewhere safe to stay. The best rabbit houses keep your rabbit protected from what is around them while protecting the sur-roundings from your rabbit. We went in search of the best bunny houses for our furry little friends, looking for a great mix between functionality and affordability. We wanted indoor rabbit houses which would not only give your rabbit a good quality of life but would look great also. The design of the houses gave us a lot to think about, and we finally settled on our five favorites. Below you'll find our top picks with longer reviews below the table. This is a great bunny cage which benefits from having three distinct areas for your bunny. On one side, you have a well-presented wooden home, in the middle, there is a spacious play area, and at the other end is an eating area. We like that the little sleeping area looks like a wooden home. 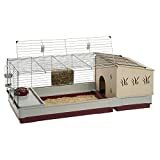 It has a homely shape with a sloped roof, a door on one end, and stylishly cut designs to let the light in and your bunny see out. Your furry little pet will love to curl up inside this sleeping area and will feel safe and secure when they are inside. The middle area is spacious and bright, allowing your bunny to run around inside (or multiple bunnies to play together). The food areas are here too, with an elevated area for a food bowl, space on the side of the cage for hay, and an included water bottle which can be strapped to the side of the cage. Keeping the food separate from the bottom of the cage is a great way to ensure that the food does not become contaminated (bunnies like to poop and mark their territory, es-pecially in new cages). The only thing which this cage is lacking is a removable bottom tray. There is a large door which you can open to get into the cage, and the top can be removed from the base, but a removable tray would have made it a little easier to clean. This cage comes with everything your bunny needs to feel safe and at home. There is enough space for your bunny to run around and play, separate feeding areas, and even a secret enclo-sure your bunny can go to when they want some privacy. The cage is large enough for your bunny to hop and run around in. You also have an elevated feeding area, so that any bunny waste cannot contaminate the food. The cage comes with an area for hay, and a detachable water bottle. We like that the elevated food tray features an area underneath for your bunny to hide away if they want some privacy. 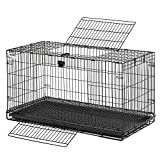 The cage could use a removable litter tray but remains easy to clean with multiple entry points into the cage and the option to remove the top of the cage from the base. Open the large doors to get into the food, litter, or just to give your bunny a scratch behind the ears. If you have ever had a problem with cages breaking or coming apart, then this is the cage for you. You will never again have to worry about your lovely bunny gnawing through parts of its home again. The bars are solid metal and coated with a non-toxic finish to protect your pet and keep them safely inside the enclosure. We like that you can stack the cages, having multiple pets in the same floor space. The addition of a removable litter tray is also something which we really like. You can clean up the brunt of your bunnies mess without removing them from the cage. This cage is as strong as it gets, and heavy because of this. It is harder to lift and move than oth-er bunny cages but does come with lockable caster wheels on the bottom, so it does have some maneuverability. 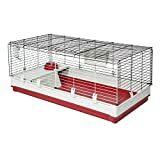 37” x 22” x 31"
This cage will fit perfectly into any home, saving space and providing your bunny with a place to sleep and eat. The mesh guard at the bottom of the cage will be awkward for small padded feet, so make sure to add a lot of cushioning for your bunny to walk around on. As any waste is collected, it will start to fall through the grates and onto the removable tray un-derneath. When it comes time to clean, you can remove the tray, dispose of the waste, and re-place the tray. You also have two doors to access the cage through, allowing you to clean the inside easily too. 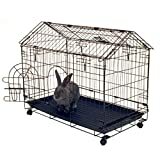 The metal bars have an Electrocoat finish making it safe if your bunny chooses to gnaw on it and strong enough to hold up to any repeated chewing: a strong and safe cage for your bunny. Metal grate needs to be padded with hay or pellets. This bunny cage has a retro elegance to it. Your bunny will love being inside of it, and you will love the look of it in your home. The cage is easy to clean but could benefit from a larger litter tray. Cleaning is easy with two access points to the cage and a removable litter tray. Simply take the tray out, dump it, sanitize it, and replace it. The only problem is that the little tray does not cover the entire cage and there can be times when bunny waste can make it over the side, though this is rare. The cage is strong and light but still has wheels on the bottom for easy maneuverability. The cage is collapsible too, folding down in seconds for easy storage or transport — a great cage which looks unlike any other.